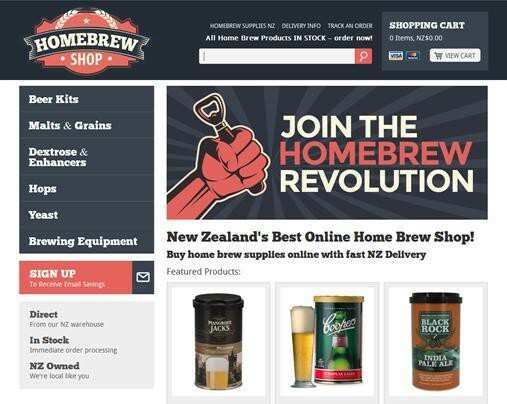 Home Brew Shop is a New Zealand homebrew supplies online shop providing brewing equipment, home brew kits, supplies and ingredients required to brew beer. GetNet designed and developed the Home Brew Shop brand and website so they can effectively provide quality brewing products available to fellow brewers throughout NZ via a fast, user friendly website. They're passionate brewers, willing to offer tips and ideas to anyone that may need help crafting the perfect home brew beer. The website is set up for people to buy the home brew equipment required to get started, including; the coopers home brew starter kit, coopers fermenting vessel, copper tun heat pad, diy hydrometers, stick on thermometers, pet bottles and more. Home Brew Palmerston North based shop stocks a large range of supplies for New Zealand wide delivery. Everything listed on the website is in stock for immediate order processing. Best selling products include mangrove jacks home brew kits, coopers home brew kits, base malts, dextrose & enhancers, coopers carbonation drops, hops and yeast.